Chicken Gravy is a simple comfort recipe that my grandma used to make when I was a kid. When she cooked, she used every last part of the bird--first it was roast chicken, then it was chicken casserole and chicken sandwiches and when nothing but the bones and a few scraps were left, she would boil the bones and make a broth. I told grandma I would never make that because I was not going to be boiling any chicken bones. Well, she passed away before she could see me eat those words, but I'm sure she was watching and probably laughing at all my failed attempts to make her creamy chicken gravy without boiling chicken bones. She also somehow probably lent a hand in how I figured it out. So here it is, enjoy! Follow directions on package for Mrs. Grass' soup, leaving out approximately 6 ounces of water and the noodles. Crush the bouillon cube and add to the kettle. Bring to a boil. When boiling point is reached, turn down to medium heat and add cream. In a separate container mix the remaining 6 ounces of water and the flour. I shake it up in a tupper ware container to get out the lumps. Add flour slowly to the cream while stirring to create gravy. If this consistency isn't thick enough for you, you can add more flour and water...about another tablespoon of flour with 2 ounces of water. Add chicken and cook until chicken is thoroughly heated. Pour over bread, toast or mashed potatoes. 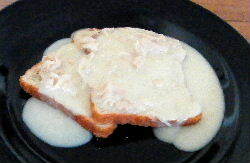 Click here for more great chicken recipes like Chicken Gravy!